Renegades attacking their 2k Pace last year! 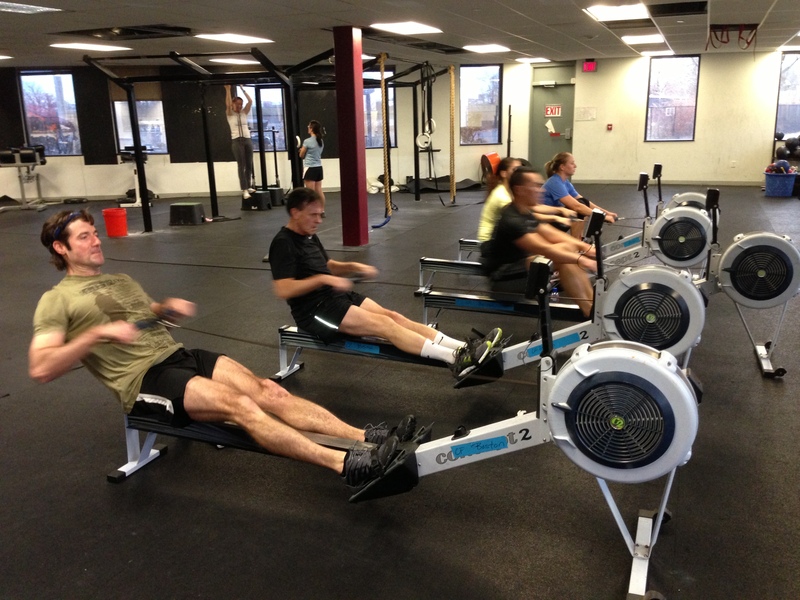 Today’s Rowing WOD is all about maintaining consistent pressure and efficiency of movement. We did a similar WOD at the gym a couple of weeks ago and I’ve been meaning to work it in to the programming. A good goal is to try to hold a 2k split for each row. So if your current 2k takes 8:00, your split would be 2:00 /500m. If you can hold your 2k split consistently or perhaps even go faster as the rounds go on you’ll be doing well. Do your best to hold onto the barbell and go unbroken for the Push Press. Be aggressive with your hips to assist/save your shoulders as much as possible. Breathe, Push, and Have Fun! This one is a great challenge! Post your time and average splits for each row to comments! This entry was posted in Fitness, Rowing, Strength and tagged endurance sports, exercise, functional movements, new sport, row 2k, rowing, sports, training by Renegade Rowing. Bookmark the permalink. Solid work Larry! Hope the 30-Day Challenge is going well! Keep up the good work! 14:20 my plan was to spend 1 minute on the row and 1 minute on the push press. Hit the first round too hard and the other 4 rounds the push press took twice as long as I had planned. Some how managed to tweak my knee doing the push presses. I like the way you attacked it Chris. Keep up the good work! Be sure to smash out your quad and all the muscles around your knee with a barbell or LAX Ball to help workout any knots. Next time you push press, double check that your dipping and driving through your heals without letting your hips chase your knees/toes. Hope it feels better!